Perfect for 7-9 year olds, these three delightful stories feature strong life lessons in courage, acceptance and perseverance from the charming creatures who live along a riverbank. Simply illustrated in black and white, these encouraging animal tales are great for young readers. 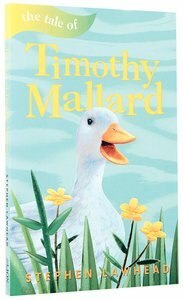 About "The Tale of Timothy Mallard (Riverbank Stories Series)"
From the moment he pokes his fluffy little head out of the egg, Timothy Mallard knows that something is wrong. Unlike his mottled brown brothers, Timothy has snow white feathers.